Today all of baseball gathers to celebrate the groundbreaking career of legendary reserve catcher Ron Hodges, who bravely shattered the Scrubeenie Barrier by serving 12 years for the same team while hardly ever rising above third on depth charts at his position. His example of self-sacrifice, waiting his turn, and hitting lefthanded while being a catcher has been an inspiration for last-men-on-the-bench everywhere including Alberto “Bambi” Castillo, Tim Spehr, Ed Hearn and Barry Lyons. To mark the historic occasion, every player in the Major Leagues today will be outfitted in the No. 42 jersey Ron made famous while rotting on the bench behind Grote and Dyer; then Grote and Stearns; and then Stearns and Grote; and then Stearns and Trevino; and then Trevino and Stearns; and then Stearns and Trevino again; and then Mike Fitzgerald. Relievers from Harry Parker to Wes Gardner found Hodges’ target while warming up in the bullpen; and managers from Berra to Frazier to Torre to Johnson called on his left-handed bat to pinch hit in crucial situations, provided they had already used Kranepool, Staub or Jorgensen. It’s an extra special occasion for the Mets, whose new home stadium features a Rotunda dedicated to Ron’s exploits including a gigantic No. 42 statue to honor his contributions. Mets owner Fred Wilpon paid Hodges the ultimate compliment by implying he might have been good enough to warm up and perhaps pinch hit for his childhood chum Sandy Koufax, a hero of his beloved Dodgers. A few weeks back, the celebration of Ron Hodges Day brought me to the resplendent Ultimate Mets Database and the profile of the reliable longtime Mets backup. And in the memories section were remarks from Ron’s sons Nat and Casey. A little more research revealed that both boys played college baseball, and that Casey Hodges — with a name like that how could he not be a Met? — is a pitcher for Mount Olive College, currently ranked No. 1 in Divison II. I passed this discovery along to Marty Noble, who in turn contacted Ron and penned this article at Mets.com recently. If you haven’t seen the YouTube guy doing Mets batting stances from the past, stop wasting your time here. If the Mets knew what was good for him they’d bring him out to Shea for between-innings entertainment. We’ll be on the lookout for what jersey will be issued to preseumptive minor-league call-up Adam Bostick, who appeared in Spring Training the past seasons wearing No. 72, and is wearing 43 for the Zeffs. The Daily News also notes the possibility that Willie Collazo may return instead. We’re also preparing plenty of outrage to accompany the pending demotion of Joe Smith to make room for the new arrival (who is expecetd to be swapped out following Wednesday’s game so as to reactivate Matt Wise). Come back here Wednesday for another Met-Lovin Big Shot interview. It will be our biggest shot yet! The Mets on Tuesday will celebrate the pioneering efforts of Ron Hodges, who broke the Scrubeenie Barrier by lasting 12 seasons in a Mets uniform, the first 11 without even being considered a regular starting option. To mark the historic occasion, every player on the Mets will be outfitted in the No. 42 jersey Ron made famous while rotting on the bench behind Grote and Dyer; then Grote and Stearns; and then Stearns and Grote; and then Stearns and Trevino; and then Trevino and Stearns; and then Stearns and Trevino again; and then Mike Fitzgerald. Relievers from Harry Parker to Wes Gardner found Hodges’ target while warming up in the bullpen; and managers from Berra to Frazier to Torre to Johnson called on his left-handed bat to pinch hit in crucial situations, provided they had already used Kranepool, Staub or Jorgensen. 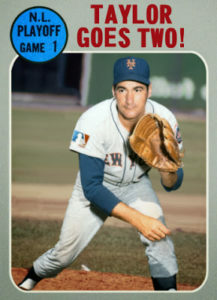 For Hodges, 11 seasons of waiting around for a shot came to delicious fruition in 1983, when as a 34-year-old, he was the starting catcher in Tom Seaver’s glorious, opening-day return to Shea Stadium. Hodges set career highs with 110 games played and 250 at-bats. * Actually, all Mets are to wear 42 Tuesday to honor Jackie Robinson. The above wasn’t meant to disparage his contributions, or Ron Hodges’s, for that matter. * Cultural omniblogger/librarian Mike Tubridy’s “Boat Against the Current” blog has nice words on Mets by the Numbers and its launch party last week. Researching 1975, we recently came across the Met debut of lefty reliever Tom Hall. “The Blade” was acquired from the Reds in an early-season trade and joined the Mets in St. Louis on April 16 where he pitched two innings of scoreless relief while wearing road uniform No. 42 (Ron Hodges, for whom the Mets had likely been carrying the 42 jersey, was doing a minor-league tour then). 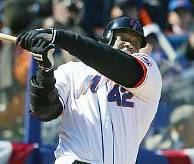 When the Mets returned home two days later, Hall was issued No. 19, which he wore for the rest of his year-plus Met tenure.